This simulator is convertible between the CRJ 200, 700 and 900 variants. In support of the nature of APS training integrating simulation devices in a representative capacity, we will use whatever CRJ variant is currently setup. The CL-600 design was stretched 5.92 meters (19 feet 5 inches) to create the CRJ100, with fuselage plugs fore and aft of the wing, two more emergency exit doors, plus a reinforced and modified wing. 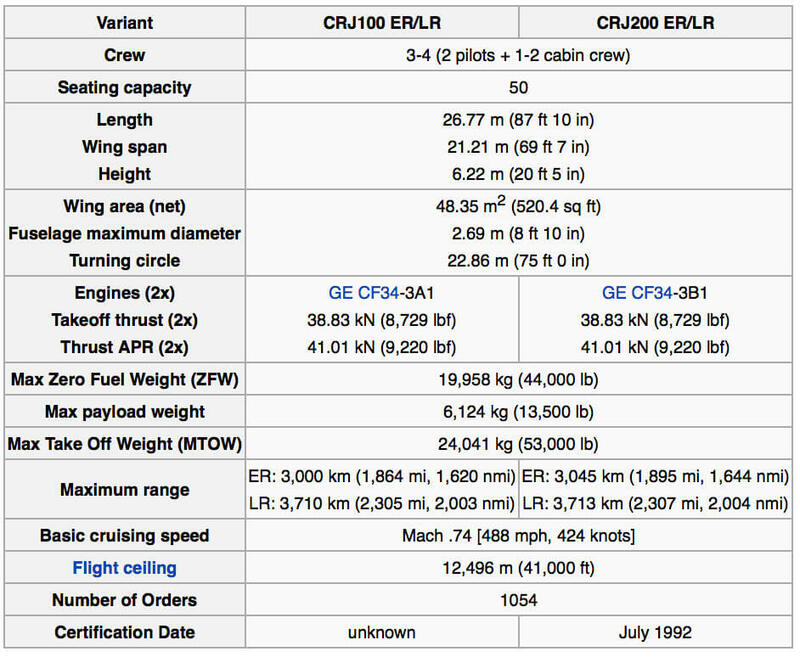 The CRJ200 is identical to the 100 model except for more efficient engines. Typical seating was 50 passengers, the maximum load being 52 passengers. The CRJ200 features a Collins ProLine 4 avionics suite, Collins weather radar, CF34-3B1 model turbofans, new wings with xtended span, more fuel capacity, and improved landing gear to handle the higher weights. The Bombardier CRJ700, CRJ900, and CRJ1000 are regional airliners based on the Bombardier CRJ200. Design work on the CRJ700 by Bombardier started in 1995 and the programme was officially launched in January 1997. The CRJ700 is a stretched 70-seat derivative of the CRJ200. 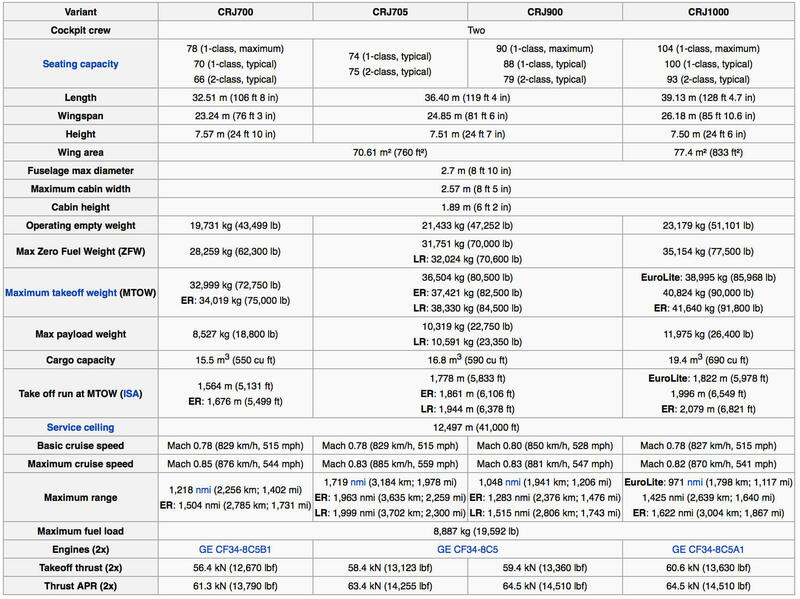 Seating ranges from 66 to 78 for the CRJ700 versions, however. The CRJ700 features a new wing with leading edge slats and a stretched and slightly widened fuselage, with a lowered floor. The CRJ700 comes in three versions: Series 700, Series 701, and Series 702. The 700 is limited to 68 passengers, the 701 to 70 passengers, and the 702 to 78 passengers. The CRJ700 also has three fuel/weight options: standard, ER, and LR. The ER version has an increase in fuel capacity as well as maximum weight, which in turn increases the range. The CRJ900 is a stretched 76–90 seat version of the CRJ700. The aircraft features two GE CF34-8C5 engines, 59.4 kN (13,400 lbf) thrust with APR, and added leading edge slats. Max GTOW is 84,500 pounds. The airplane is loosely based on the CRJ200 series with a few major improvements. The environmental packs have a target temperature instead of a hot-cold knob. The cabin has a recirculation fan which aids in cooling and heating. The engines are controlled by FADEC digital engine control instead of control cables and a fuel control unit. The cabin floor has been lowered 2 inches which gains outward visibility from the windows in the cabin as the windows become closer to eye level height. The APU is a Honeywell RE220 unit which supplies much more air to the AC packs and has higher limits for starting and altitude usage. The wingspan is longer, the tail is redesigned with more span and anhedral. In typical service the CRJ900 can cruise 8–10,000 ft higher with a slightly higher fuel burn and an average true airspeed of 450–500 knots, a significant improvement over its predecessor. The FAA Type Certificate designation of the CRJ900 is the CL-600-2D24.